Happy Monday, everyone. It's my kids' first day of school today and though I'm always a bit sad to miss their good company for the day, I'm also excited to get a lot done. First on my list is today's HELLO Giveaway. If you have been reading my blog for a while, you will know that I invented a nifty little hair accessory called Trash Ties™. Do you remember when trash bags used to come with a set of twisty-ties in the box? Before trash bags became stretchy and cinchable? I named my invention Trash Ties in homage to those old-fashion twisty-ties. 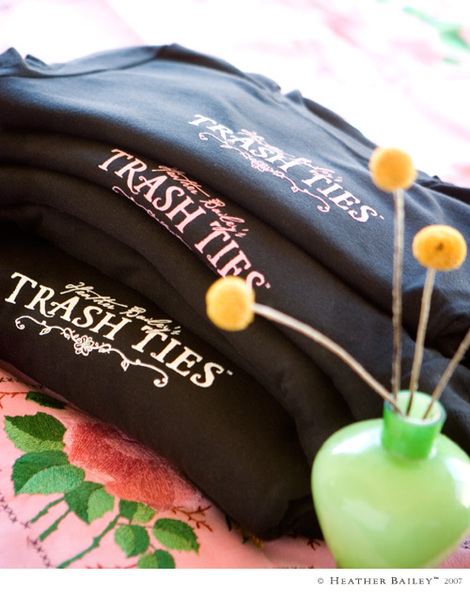 Trash Ties were invented before I started showing my artwork publicly and designing fabric, housewares, stationery, etc. Before Heather Bailey became Heather Bailey. Elijah was a small toddler when I invented Trash Ties. And, in many ways, it is my second child. 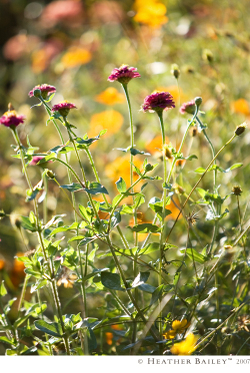 I birthed the patent, fed and nurtured the business, and watched it bloom. Dare I admit, this gives me maternal stirring even today, many years later. They really are incredible. And they are so easy to use with a little practice. I intended to create instructional videos for you a long while back when I first announced Trash Ties on my blog, but right as that project was getting organized, began a truly horrible experience for me and my family. I've never mentioned it here. And I'm only going to in passing at this time, but a woman who ingratiated herself into my life under the guise of friendship, positioned herself to pose as my company and lie to my customers. She strategized with her spouse to steal confidential information and proceeded to build a company to sell my patented invention as though it was hers. I only knew them for a few months. But, stealing from me and my family became this woman's focus for years to come. They mimicked all of my photography down to the finest details to mislead the public, stole language from our brochure, told my customers that we were "sister companies," sold to several national chains, and made hundreds of thousands of dollars doing so—according to their manufacturer who they stiffed on their last $35,000 manufacturing bill. It was not a smalltime thing. I learned of this nightmare right as we were planning our instructional videos. I cried myself to sleep every night for three years straight. 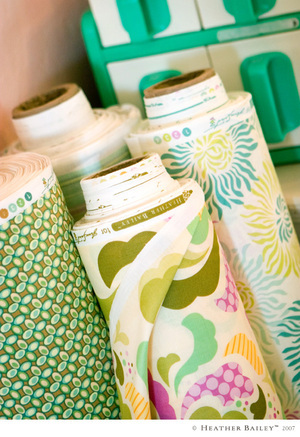 To steer my mind away from the sting, I focused on my other business — fabric design, sewing patterns, housewares, etc. I am so incredibly fortunate to have had an alternative at that time. And yes, I'm sure this harrowing experience has contributed to my tender gratitude for your support of my artwork and business—thus, my mad idea to have a month of giveaways midst my other obligations and deadlines. I am truly grateful for you. Trash Ties are still mine. They always have been. I just happened to build up another exciting and busy company in the meanwhile, while healing. Sketching was my song. Fabric was my restoration. We might do videos yet—I'd really love for you to see Trash Ties in action. I know that many of you sew, so I'll tell you something I don't usually tell a crowd. Doing your hair with Trash Ties is like 'stitching' your hair up. There is a unique bendable, tempered wire inside that holds your hairdo in place. With the small ties, you take individual 'stitches.' With the long ties, it's more like 'stitching' with a long, flexible, secure 'thread' you can whip-stitch around or through your hair. Basically, you just have to cinch them tightly. You don't twist them, just wrap them around snugly. 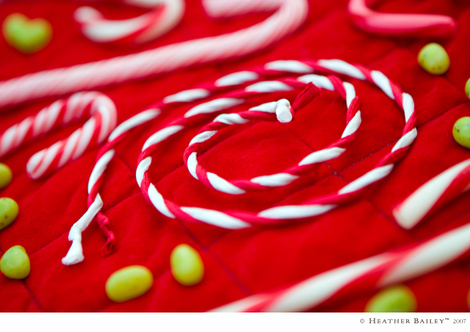 As you wrap them, you want to make a closed circle, not an open spiral. This way, your hair won't wind out. In the end, it looks like there are little ribbons in your hair. With neutral Trash Ties, they can blend right in, like above. Yet, you don't have to work to hide them, like you would with bobby pins. Let 'em show. They're washable, reuseable and super versatile. Okay. So, I didn't intend to tell you that story today—though it is a tremendous relief. Thank you for hearing me. In some ways, it feels like I'm taking my first deep breath in a long time. And I didn't intend to include instructions for use either. Clearly, I'm a little disoriented from my kids being back at school. The punchline is, today's giveaway is Trash Ties, one set of short ties and one long tie—winner's choice of colors. And we have TONS of colors and prints—and you'll be glad to know that basic black is now back in stock. This little product makes me truly happy. For me, it is a gift from God—quite literally. For you, it can simply be a breezy and fun way to do your hair—an unmatched creative tool for expressing your personal style. Comment to enter today's contest. Be sure to include your email address so we can contact you if you win. Today's giveaway closes at noon PST on Tuesday 8/6/13. I didn't get this post up until the afternoon, so I've extended the deadline this time. Watch for the winner to be announced within a day or two at the bottom of the post. Wow, so I really need to go on a run or something. That was a doozy. For more info on my August giveaway madness, click here. We have some seriously amazing prizes planned, including tools, equipment, jewelry, toys, Project Life, stationery, fabric from my next collection (which I'll introduce this month)—exciting stuff. Please share the word. Check back every day. June has been beautiful this year. Normally it's breath-suckingly hot in June in Arizona. We've been camping and canoeing, working in the yard, and eating outside at every chance. Being outdoors with my family more than usual this month has put me in a good place for the Fourth of July. Something about the lush cornfields that surround us, the well-groomed campsites we've visited, and driving along the Mogollon Rim has me feeling patriotic. In the last month, I've seen a bald eagle nesting on top of a dead pine tree, 200 feet up, I've picniced in a field of wild strawberries and I've watched hundreds of Great Blue Herons dive for fish to feed to their hatchlings. If you ever camp in Arizona, make a point to visit the movie-perfect Woods Canyon Lake. It's looks almost fake, it's so beautiful. We have a few more campouts planned for the summer. 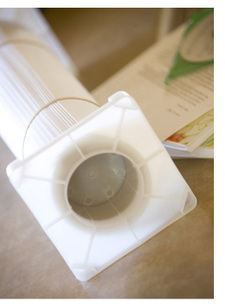 In prep, I've been working on some fun camping crafts, recipes and whatnot. We whipped up a perfect blackberry grunt in our dutch oven that turned our teeth black -- as though we didn't feel mucky enough without black teeth. But it sure was delicious. I'm almost to the crest of the mountain with my design work too. 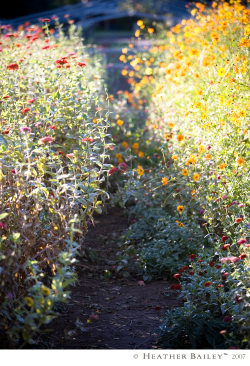 That place where things begin to glide. Several projects now have enough stored, potential energy to self-propel when released. Like a stretched spring. First, a little more stretching to do. Burn baby burn. It's looking like a great summer. I asked Charlotte how she wanted her hair done today. I fully expected a ponytail request, or pigtails, or braids. Instead, Miss Salty replied, "Make a hair do that nobody has ever seen before." Well, en garde! Challenge accepted. And don't get too boggled studying the photo. I've put together a Hair-Do How-To pdf to untwist the mystery. Click on the image below to download the pdf instruction sheet. This hairdo reminds me of a celtic knot -- and is a real cart-stopper I should warn you. Three different people stopped us on our milk-run to the grocery store to ask how Charlotte's hair was put together. I figured a pdf would make the explaining much easier. 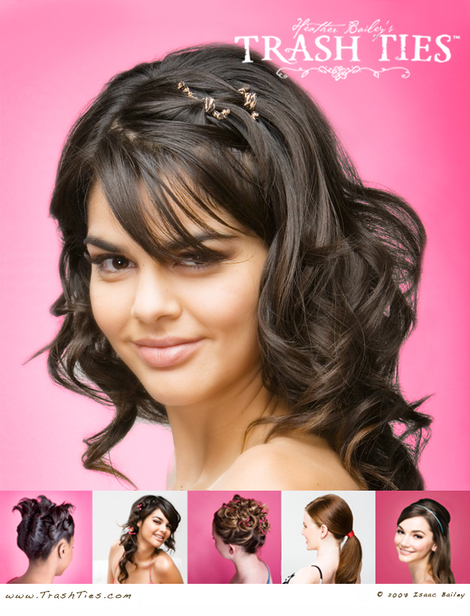 If downloadable hairdos work for you, let me know and we'll put together some more Trash Ties tutorials. 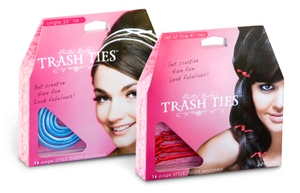 In fact, send us photos of your own Trash Ties hairdo creations and perhaps we'll design a pdf to show off your twisted ingenuity. I sorted through old pictures today from before we had digital cameras, from before we had Charlotte. For hours, on my entryway floor, I flipped through picture after picture of Elijah as a small child, then left to pick him up from school. When he opened the car door to sit next to me, I swear my peripheral vision blurred into quick streaks of bright colors and I fell forward into one of Wheeler's 'wormholes.' When did my son become a young man, all angular and grouchy? When did my hair grow long? And have a full ten years really gone by since I invented Trash Ties? There's a great article in this month's Go Gilbert! magazine outlining my personal history with my children's hat company, Noggins, the invention of my Trash Ties hair accessories, and later finding my passion for art and surface design. If you're in the Gilbert, AZ area, pick up a free copy at a nearby salon, office, or restaurant, or click here to browse through the issue online. Interviewing for this article really took me back to the sweetness and the struggle of my life ten years ago. To the tiny city apartment we shared in Hollywood where Elijah and I spent all of our time together and often did not get outside for days on end. After living in that apartment for a few months, I began to feel unexplicably uneasy about it and to feel strongly that we needed to move. I loved living in Hollywood, but there was something wrong that I couldn't pinpoint. Drumming up money for a new apartment fell to me and I had meager resources. Isaac worked till late into the night and took with him our only car. I had toddler Elijah with me at all times and the internet was pretty useless back then. As time went on, the prompting to get out of that apartment grew steadily stronger. It was a problem I tried to fix alone, but could not. It was a difficult, dark time. One night, after sitting about in a stupor for weeks, I knelt in desperate prayer for help and within half an hour of that prayer, was handed Trash Ties. It wasn't a literal handing-over, but spiritually, that's what it felt like. Like a gift tied in silk ribbon, with a note saying, "You are loved. Everything will be okay." At 23, that was my first hugely spiritual experience. With a little experimentation, Trash Ties were invented in the late evening of January 25th, ten years ago last week. In the months following, I worked around the clock, squeezing every ounce of hope and will power into patenting Trash Ties and preparing it for market. It was a raw, tender time, but man am I grateful for the adventures we had back then and for all that we learned! In digging through old photos today and in reading over this new Go Gilbert! article, I realized that I have yet to tell that early story. The struggles I went through and the help I received along the way are an integral part of my personal journey and I need to keep that history. Yes, Trash Ties enabled us to move from our Hollywood apartment. It wasn't till a year after we left that I learned why I had felt so strongly about moving. It's a crazy story, involving one horrifically sick little boy. I'd like to continue telling that story here and there in future posts if you can go easy on me for getting emotional at times. The reflection does me well. Some old memories seem like forever ago and some seem like yesterday. I have learned a lot and I have a lot to be grateful for. 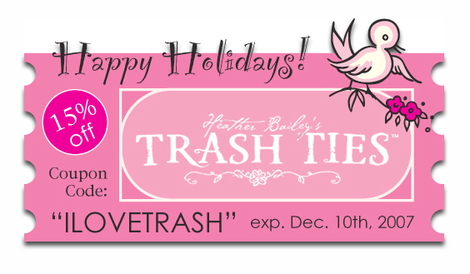 Here's another holiday Trash Ties giveaway! Visit Simple Mom to enter. Tsh is giving away a gift basket of health & beauty items, including something called 'Soap Nuts' for your laundry. Isaac's snowy Photoshop doodle reminds me I need to go snap a photo of Charlotte's new dollhouse in progress. It's getting there -- slowly. We had better step to it. One more week till Christmas. And here's a news spot on Trash Ties from Studio 5. April from Sweet Life in the Valley put together a whole presentation on great Christmas gift ideas. The Trash Ties section is about half-way through. If you've ever wondered how tightly Trash Ties hold, watch the host's finger turn purple. Hair, Hair, Hair, Merry Christmas! Psst. 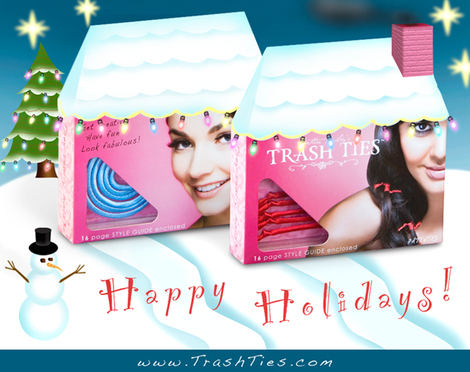 There's a Christmas Trash Ties™ giveaway taking place at Sweet Life in the Valley today. Read the post for how to enter. It's a one-day thing & we're well into that one day -- but you may still have a shot at it if you hurry! 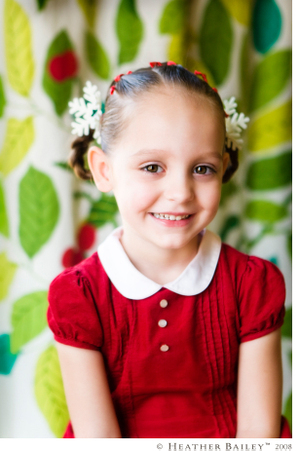 When I was little, my favorite dress-up hair-do was looped pigtail braids. 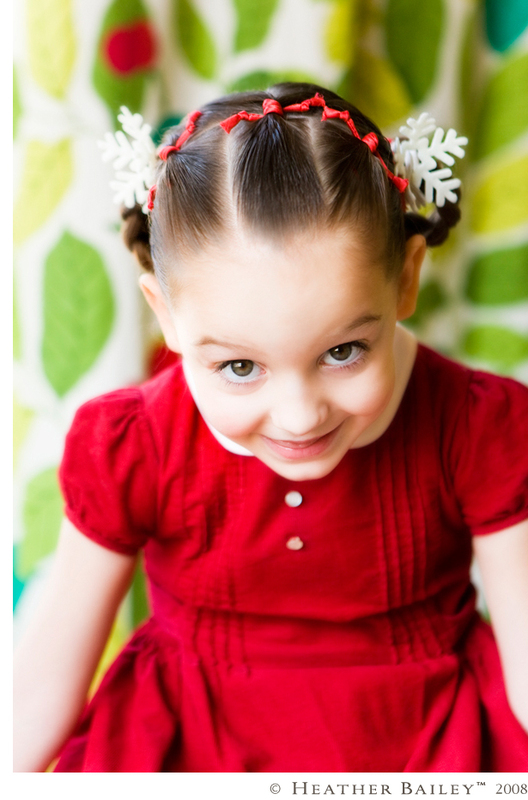 So, when Charlotte agreed to get Christmas-ed up for a recent photoshoot with a vintage theme, looped pigtail braids were the must-do hair-do. I couldn't remember what my mom would do with the ends of my braids though. This required a phonecall. Turns out she tucked them up under the rubberbands that held my pigtails in place, so the ends of my hair were hidden next to my scalp. Of course, I had to try this hair-do out with Trash Ties. The result was much tidier than my previous attempts with rubberbands. Because I could just wrap a Trash Tie around each looped braid to secure it -- and I didn't have to stretch a rubberband around the braid over and over -- the braid didn't get all frayed and fuzzy. And I could easily adjust the loops to match each other. The snowflakes? Those were trimmed off of a felt garland I picked up at Hobby Lobby. The same Trash Tie that's holding each braid in a loop is holding each snowflake in place. I just hooked the ends of the Trash Ties through the centers of the snowflakes. Kinda like tucking paper into a paperclip. Why am I going on about the hair-do? Who knows. I'm nostalgic for looped braids, I guess. What I really should be rambling on about is this adorable little girl who is every bit as sweet and wonderful when her hair is askew and dreaded up with popsicle juice. The red & white dress makes me giddy too. It gets my right in my Annie spot. I don't believe I can sneak-peek the Christmas projects from the Creating Keepsakes article this early, but I can certainly sneak-peek the little sweetie who helped me with the shoot. Other than the elvish nature of this week's work, we haven't yet had a chance to break into Christmas this year. The Christmas decorations are stacked in boxes in the middle of our living room and have been for two weeks. This year will have to be condensed, with extra Christmas effort and activities packed into the end of next week. We'll make it particularly fun so the kids don't notice they had to wait! Oh gatz! I'm getting weepy. My friend's two daughters are over to help and they're watching Fiddler on the Roof while they work. Sunrise, Sunset is bellowing from the other room and I can't get through that song without tearing up, even if I'm in a distant room focussed on writing this post! I've got to wrap it up before they get to the Chava Ballet song, the one that starts, "Little Bird, Little Chavala." Oh forget it, I can't even type it out. I'll move on. One of my favorite movies, anyhow! Wow, thank you for the well-wishes. I would be glad to put together a pattern for that quilt if I could find a snippit of time to spare. It might be far more immediate to just mimic it this time. So, guess who found me last week -- a woman who interviewed me for Trash Ties years ago for a now-defunct web magazine. We met at the Fairfax High Flea Market -- the very first day I ever sold Trash Ties. It wasn't a craft-fair- type Flea Market either; it was a true junker. I was completely out of place. I had a booth full of all sorts of fancy, hand-made things -- hats, baby clothes, jewelry, etc. At the very corner of one of my tables sat a bowl full of Trash Ties, each set wrapped with a cheap, photocopied label. One small bowl. That bowl had to be replenished many times throughout the day. And well before the day was through, I sold out of the Trash Ties completely. I hardly sold anything else. Hundreds of dollars in hair thingies, I knew I had struck gold. Those Trash Ties were then hidden-up until the provisional patent paperwork was submitted. That was the same day I met Scott Williams, the Head Hairdresser for Dharma & Greg at the time, who later helped me on many occasions - for free. Such a godsend. Oh, and Kathy Najimy bought some Trash Ties that day -- one of those "odd, somewhat-meaningless celebrity encounters" I've alluded to. Do you guys even know who she is? Anyhow, Jennifer -- that's her name -- found me through someone else's blog, read the words,"Trash Ties," and ding! (a light in her mind and a new email in my inbox). She reminded me of our Flea Market meet-up and a lunchtime interview at a floral shop cafe on La Brea. Gosh, she even remembered where I'm from. Whoa! Have you ever heard the word, redintegration? This is one of Isaac's favorite big-shot words. In layman's terms, I'd say it's when one memory opens doors to many more. That email brought on some serious redintegration. The floral shop, The La Brea bakery a few doors down, the nearby fabric store, the bomb-scare at the grocery store, Scott Williams' stories of being a straight, fat, curly-haired British guy (now very much thin, bald, American and gay) and so on. Oh, it goes on. I love emails like that. Just another glimpse at the inter-connectedness of it all, and moreover, the reach of the internet. I was also contacted by one of Isaac's old work buddies this week, Mike. I don't think I ever met Mike, but I sure heard his name a lot. (Yes, this brought on a bit more redintegration, but nothing monumental or even very interesting.) So, why do I tell you about Mike? Well, Mike found the URL for that live video of me from a couple of posts ago. So, if you hurry, maybe you can still watch the segment before its cleared off ABC's server. Thanks, Mike! Oh, and thank you, Typepad for featuring my blog this week. Whoever writes those features makes every blog sound amazine. Oops, amazing. But, Amazine would be a great zine name, wouldn't it? The flower photos? Just something pretty I had kickin' around. 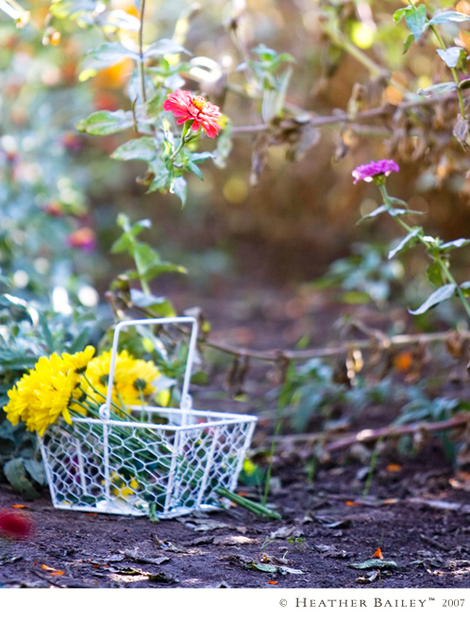 Flowers go great with memories. Ooo, scandalous! Maybe too scandalous-sounding. Hmmm. 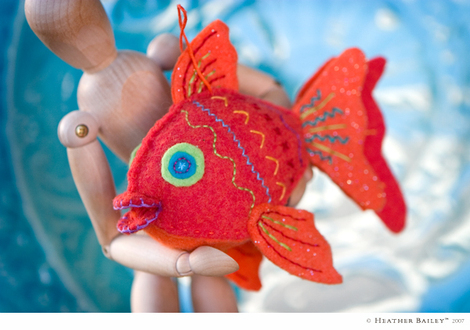 But, nothing fishy's happening -- just a behind-the-scenes peek at yesterday's Trash Ties photoshoot. Yes, I still need to tell you all about my hair accessory invention. I won't forget. I'm launching them at CosmoProf in two months and I'll do a tell-all post or three. The plan is to put together a Trash Ties website with tons of photos and videos to explain them fully. True, there's not much hair-accessorizing to see in these photos. That was on purpose : ) I don't want you to know what Trash Ties can do until I've nailed down the manufacturing. (Cuz once you see them in action, you're going to go NUTS. And I can't handle that just yet. July, hopefully.) Do any of you have amazing manufacturing contacts - US, Mexico, anywhere? We have a couple of manufacturing guys sourcing things, but boy is it a slow process. Yawn. Isaac took a beautiful photo for a full-page ad in the CosmoProf guidebook. And, the wrapped ribbon comes across perfectly friendly-like in the finished shot. Think conceptually -- getting caught up in Trash Ties. It's more of a tangle. I'll show you the final picture this summer -- it's powerful and dramatic. I know, I keep doing that. Teasing. It's not on purpose. I just want to post about what' s going on. At some point, the dam will break and there'll be a deluge of new fabrics, sewing patterns, hair accessories and more. I don't have a specific book in the works. Patterns first. The book thing is just on my list for the coming year.